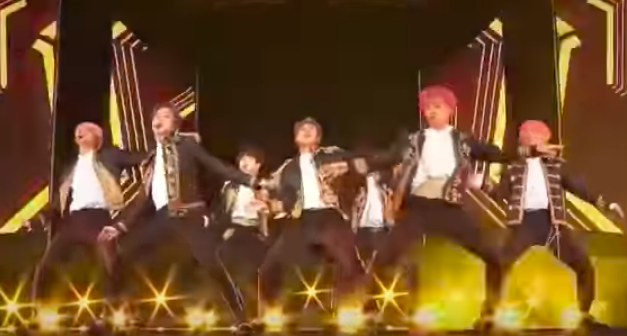 Reports of fake tickets causing would-be viewers of South Korean boy band BTS to be turned away from their January 19 concert at the Singapore National Stadium have surfaced. The popular singing group is on their Love Yourself World Tour, back in the country after four years. Many of the fans were scammed through tickets they had purchased online through sites such as Carousell and StubHub. Concertgoers had been told that valid tickets would be scanned only once at access points. The New Paper (TNP) reported that when some fans presented the tickets they had, they were told that the ticket had already been scanned and the bearer allowed entrance. In other words, unscrupulous individuals had bought valid tickets online, made copies, and sold them, passing them off as legitimate. 1,277 such online purchase scams in Singapore have been reported, with losses of S$ 930,000, according to the National Crime Prevention Council. Tickets for the BTS Love Yourself World Tour normally cost between $88 and $348, but some fans bought them for significantly higher amounts. The fact that some tickets ended up being fake only added insult to injury. 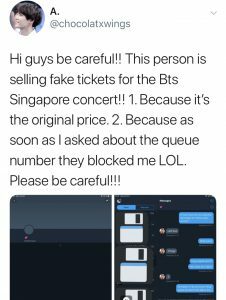 Online seller Carousell has said that it is communicating with people who claim to have been scammed with fake BTS tickets. 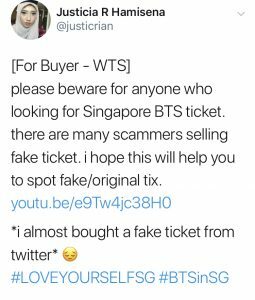 They’ve also suspended one user account that failed to deliver tickets for BTS’s Singapore concert. 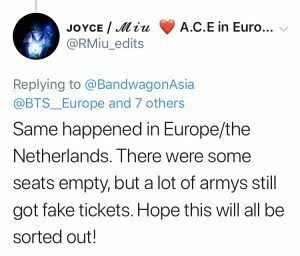 Warnings that fake tickets were being sold were circulating even last year when the concert was advertised and the tickets began to be sold. 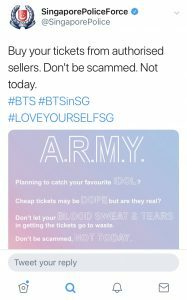 Even the police force tweeted to warn the public about fake tickets to the BTS concert. 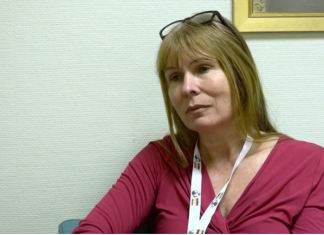 According to some netizens, Singapore is not the only place where this has happened.